Gooding & Company, the official auction house of the 58th annual Pebble Beach Concours d’Elegance®, captured total sales of $64.2 million including several of the world’s rarest and most spectacular automobiles during its two-night auction on August 16 and 17. 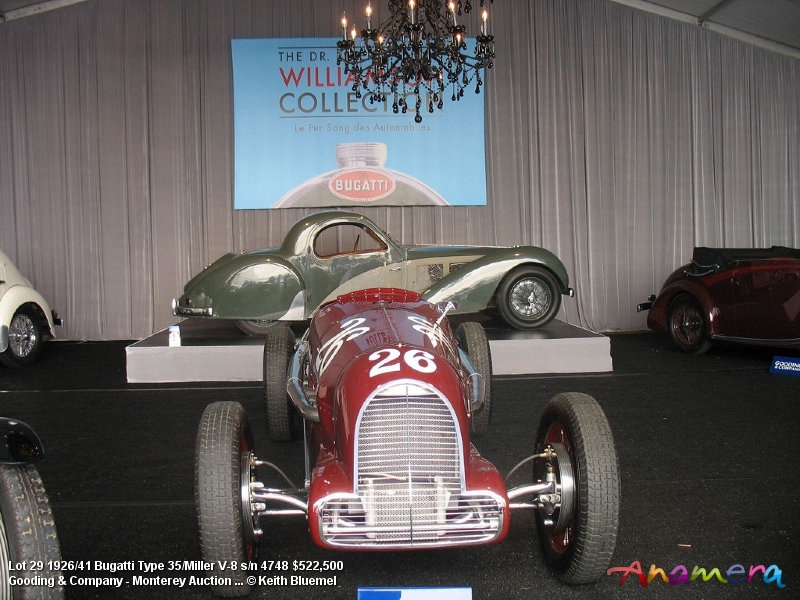 An international crowd of collectors and spectators were captivated as 140 lots crossed the auction block including top private collections, vintage racing cars and individual automotive objets d’art such the 1937 Bugatti Type 57SC Atalante Coupe, which sold for a stunning $7.92 million -- setting a record for the highest price ever paid for an automobile at a North American auction. "Our auctions at Pebble Beach this year represent the finest grouping of cars we have ever had the honor to offer, and the strong sales results reflect that exceptional quality," said David Gooding, president and founder of Gooding & Company. 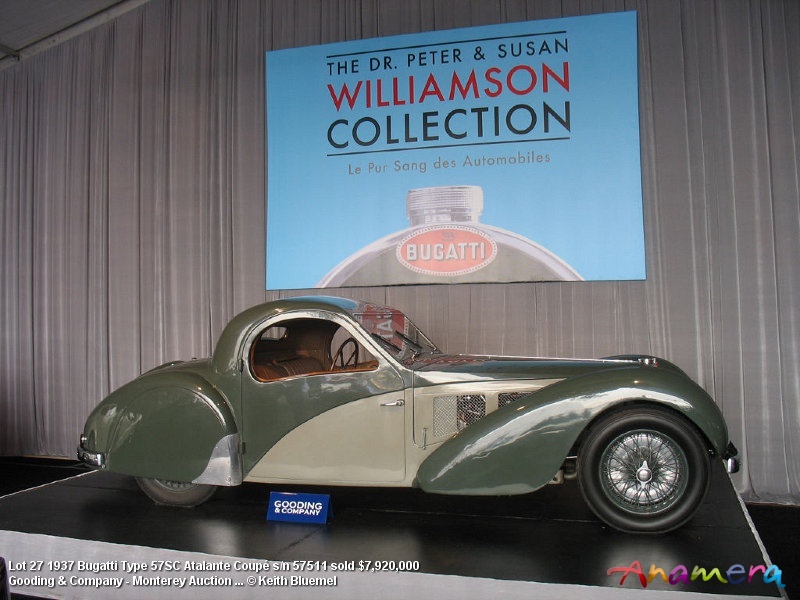 "We’re proud to have set the North American auction record with the $7.92 million sale of the 1937 Bugatti Type 57SC Atalante Coupe, and to have reached noteworthy milestones in a host of other categories as well." The Gooding and Company auction on Saturday and Sunday included 20 cars that sold for more than $1 million - 5 of which sold over the $2 million mark. Above the $2 million mark, in addition to the 1937 Bugatti Type 57SC Atalante Coupe which sold at $7.92 million, highlights include the legendary 1959 Ferrari 250 GT LWB "California" Spider which sold at $3.63 million, the famed 1938 Alfa Romeo 6C 2300B Mille Miglia "Sleeping Beauty" at $2.585 million, and a 1950 Ferrari 166 MM Berlinetta Le Mans that fetched $2.2 million. Gooding & Company also auctioned chassis 001 of the 2009 Bugatti Veyron 16.4 Grand Sport benefiting the Pebble Beach Company Foundation which delivered an impressive $3.19 million. 1907 Thomas Flyer Model-36 60 HP Touring "Blondie" ($1.028 million). 1914 Stutz Series E Bearcat, one of six known to exist, scored a record at $1.375 million. The Carl J. Schmitt Collection of eleven Brass Era automobiles sold for nearly $2.2 million including the 1901 Packard Model C Dos-à-Dos Runabout, which set a record for its type at $214,500. Another highlight of the evening was the sale of Oprah Winfrey’s Charity Car Collection, which sold for $716,000 including her 1954 Mercedes-Benz 300 SL Gullwing with proceeds to benefit the annual Arts and Culture Workshop at The Oprah Winfrey Leadership Academy for Girls – South Africa.